Drama, Puppet, and Storytelling Lessons, Ideas, Activities, and Resources for Teaching David and Goliath in Sunday School. Post your Sunday School drama, puppet, and storytelling lessons, ideas, activities, and resources for David and Goliath here. David and Goliath, Harp, Philistines, Armor, 1 Samuel 17, etc. Bible lessons about David and Goliath -with Drama, puppets, scripts, skits, acting, newsroom, etc. This was a 35 minute lesson time conducted as a videotaped drama. We begin with First Samuel 17... reading it all the way until David kills Goliath (v50 I believe). It is good to read through in its entirety for 2nd grade on up. We had fun "doing the voices." We chose several verses and each took a crack at saying them in our best "Goliath voice" or "David voice." Quite memorable. After turning one of our kids into Goliath using a large blanket and step ladder and props, we stopped and briefly talked about the Giant problems we sometimes face, just like David. We talked about the different reactions they (we) have to big problems, fears, danger. Then we assembled the Israelites and David (two pictured here). They had a lot of fun pretending to be small and speaking in squeaky voices to accentuate their powerlessness. We had the Israelites make fun of the slingshot, with David proclaiming that it was God who would make the victory. They got into the shouting and play-ridicule, especially Goliath. The second week we did this drama I let different kids take turns being Goliath, since that was the most fun. We also gave David some cool sunglasses. Quite by accident, one of the kids made 'stones' out of balls of ducttape. One of them actually stuck to Goliath's shield much to their delight. That gave me the great idea to hand the Davids and the Israelites extra balls of ducttape. I told them they had to name a problem God can help them with before they got to throw their 'stone' at Goliath. The beauty of a videocamera is the PAUSE button. We were able to stop the taping and work on "lines" (no script, we talked through that, and afterall, they had just read the story). This took quite a bit of time, and throughout the practicing, taping and retaping. As the teacher, I kept reinforcing central ideas and had Goliath practice put-downs. One of our Goliaths even told David he was stupid for going to church, "it's boring and for shrimps" she said. David responded! The videotaping provided glue and direction to the play-acting. They couldn't wait to see themselves on the TV. FYI... we kept the camera hooked up to the TV WHILE we were taping so they could see themselves and know when the camera was "on" them. It's another "trick of the trade" I've learned over the years. They love to see themselves "in the act." We finished with a prayer about "having the faith of David to believe God will help us in our lives." Before the prayer, I asked them to think of how David and you can "get" your faith. Talking to God was tops, followed by "church." We just used the Goliath on a ladder and little David idea from the picture shown above. Then we sat down and listened to the song "The Voice of Truth" by Casting Crowns. After talking about the song, I put a drawn picture of Goliath's face on the ladder. Then I pinned a sign on Goliath that said DARKNESS. I asked if anyone was afraid of the dark. Those that were stepped forward and were given socks filled with cotton balls. I told the students that the giant's name was no longer Goliath but Darkness. I played the song again on the tape and using the words from the song softly telling the children that Darkness is telling them they will never win but the Voice of Truth is telling them Do not Be Afraid. I told them when they were ready to throw the balls at Darkness. We repeated the excercise with other signs like BULLIES, NEW SCHOOL, SICKNESS etc. The kids from Kindergarten to our 6th graders really enjoyed it. "The Lord will deliver me"
Object Theatre play representing the story of David and Goliath. Adapted from the New King James Version. Why: I like this kind of play for representing battle stories. There aren't any bad guys, just misguided salt shakers and soup ladles. Also, David & Goliath had lots of action. You really do need a play for this study unit! Large assortment of kitchen and table utensils from recycling depot for the armies of the tall people and the hill people. Googly eyes, yarn, white glue or glue gun for embellishing objects, if you wish and time allows. Once there was cute little baby spoon. He had a lot of older brothers. [Stick up older bros – could be shakers, small pickle forks, pate knives, etc.] There were a rather short-legged, thick-ankled lot, skillful at hill climbing hill fighting. The baby spoon’s main job was tending sheep. He was a very good guitar player. Everyone loved him. His name was David. There was a battle going on nearby. His brothers went to fight as soldiers in that battle. The battle was not going well. It was against a group of very tall egg flippers and ladles and barbeque tongs. Then the tallest of them all -- a huge barbeque flipper – arrived on the scene. He was quite rude and said that no one from the army of the hilly country was brave enough or good enough to fight him. One day when David was bringing some bread and cheese to his brothers in the field, he heard that loud mouth giant. He was so insulted that he jumped up and offered to fight the giant flipper himself. David didn’t want that smelly lardy old armour any way. He had his trusty sling. And with God’s help, he had always protected his sheep from any lions or bears. So David picked up five perfect sugar cubes from the nearby river, put one in his sling, flung it at the lippy giant, and popped him right in the head. It was such a good shot that it in fact killed the giant. It’s of course not nice to kill people, but this was sort of okay because he was mean and would probably have hurt lots of hill people later on. Once the tallest of the tall people fell down dead, the rest of them got scared and took off at a run, and the battle was pretty much over. Everyone was amazed that a short little rock-slinging, guitar-playing squirt like David had stood up to the giant and killed him with something as puny as a sling and a sugar cube. But David wasn’t surprised. He knew anything is possible if you trust in God. Students are first introduced to the concept of what is on the outside is not always as important as what is on the inside: Arbitrarily select a student to choose one of three possible gift boxes - one of which is decorated lavishly yet contains "clean" trash, another of which is decorated moderately yet contains paper clips, and a third which is shabbily decorated yet contains candy! Students will then actively take part in a retelling of the story of David and Goliath. Key Verse: Joshua 1:9 (CEV) "Don’t ever be afraid or discouraged! I am the Lord your God, and I will be there to help you wherever you go." Rely on God because God is more powerful than anything you will face in this world. God works in ways we do not except and through people we do not expect. We should not seek success: we should seek to serve the Lord. Leave with a better understanding of how our faith can strengthen us when we believe and trust the Lord. Have a clear picture of what the meaning of the scripture in I Samuel is telling us about how David served the Lord and be able to relate the story to their own lives. Learn that by reviewing the history of David’s people we will understand what he did for his family and for the Lord. Understand that what is on the inside is often more important than what is on the outside. Read Bible Background and scripture. The three “gifts” wrapped with the specific contents noted below. Any props you deem necessary to make the story come to life for them (sling shot, wool of a sheep to pass around, a shield, or some sort of armor). A large shoe box wrapped so that the lid lifts easily off without disturbing the wrapping. (So that the box can be used in subsequent weeks of the Rotation.) Wrap this box in beautiful paper and make it very tempting looking: Pretty ribbons/bow, very colorful paper; looks like a “million” dollars! The contents of the beautifully wrapped box are broken sticks, some dirt, candy wrappers, “clean trash,” etc. The second gift is pretty (but not too pretty) bag, of average size. The contents should be cotton balls, rubber bands, paper clips, grass or leaves. The third gift is a brown paper lunch bag that is very crumpled and looks old. Inside of the bag have a treat like gummy bears, life savers, jelly beans – enough for the class to eat! 1. Greet the children and introduce yourself. 2. As the children come in give each child either a smooth stone or a penny. Tell them you will explain the use of the items later. As we continue to study the life of David we want to discover how one’s faith in God can help make one stronger in times of trouble. Today we are going to find out how David was able to help his people and the nation of Israel by defeating the Philistines. You will find that David was not afraid and that he used his skills of a Shepherd boy along with his faith to conquer what the army of Israel was afraid to do. 2. Ask them to bow their heads for prayer. 3. Tell the story. You can read the story from a children’s Bible storybook. Older grades: With grades 4 and 5, give out slips of paper with the following Bible references. Ask the other children to follow along. Calling on students to read is a way to get them to interact in this class. I Samuel 17: 4-7, I Samuel 17: 8 and 11, I Samuel 17:13- 16, I Samuel 17:37, I Samuel 17:47, and these scriptures: Psalms 46:1, Psalms 118:8, and Nahum 1:7. 4. Provide an opportunity for questions, in case the scriptures are not understood. If you find that there are words or phrases that might need to be clarified for the various age groups, please do so. You will provide more detail in the retelling of the story. Pull out of your bag or box the following three “Presents” and place them in front of you. Inform the students that one of them is lucky today. The student with the (black rock, rock with a colored dot, the penny that is shinny, who has the birthday closest to today, etc) whatever method you decide to use to select one child, comes forward and picks a gift. They are not to pick up or touch the presents to check them out; they are to point to the one they want to open. At their selection, hand the gift to the child to open. Before he/she opens the “gift” you explain that they will have to share with the rest of the class the contents of the gift. More than likely the child will select the big box wrapped up so nicely! The contents are to show us that what we see is not always what we get. What is on the outside is not always as important as what is on the inside. Show them what was in gift in the brown paper bag that was ugly and not chosen. OR if the ugly brown bag was selected, ask why, over the other "pretty" gifts? Our faith in the Lord is something we carry in our hearts. People can not always see what we believe, as you will find out in our story today about David and Goliath. The retelling of the scripture is found at the end of this lesson plan. You should ADD PROPS to EACH PART OF THE STORY AS YOU TELL IT. These props should VISUALLY REPRESENT that part of the story or its meaning. For example: for the word "strong" you might pull out a chain and tug on it before laying it on the floor in front of you. Place each item in order as you tell the story, then at the end of the story, MIX THEM UP and invite the class to put them back in teh right story order. Let them know ahead of time that they should try to remember the items/order. Explain to the children that when you speak the word David, the children with the stones should quietly place their right hand over their heart and everyone should continue to listen. When you say the word “Goliath” and the military might – the children with the penny are raise both hands as high as they can without making any noise and continue to listen. Practice a dry run prior to retelling the story. After the story there will be a few questions. Some of the questions are basic review questions, while others will be ones to make the story relevant to their life today. See the story script below. Ask the shepherds to pass out the journal sheet and pencils/markers. Suggestion: You may wish to give the children a sticker or some memento to paste on their journal page as a reminder of the story or activity, if you are taking up the pennies and stones. Prayer: Pass out all the objects from your story and invite students to come up with a prayer of thanksgiving about each. Then during your prayer time, have them walk forward and place the item on the table and speak their prayer out loud. Bible Study led by Lori Houck the Kirk of Kildare, Brueggemann’s First and Second Samuel Interpretation. David and Goliath – The story script for retelling. Our story today comes from the Old Testament, the Book of I Samuel chapter 17. Israel was a nation trying to grow and prosper and at the same time defend land that they believed belonged to them. The battles took place in deserts, valleys and the mountains. The Israelites in this story have made camp on a hill over looking Elah Valley and on the other side of the river valley the Philistines have set up their camp. The Philistines are a tribe of people that are known for their height. The leader of the Israel Army is Saul. Saul has not been a good leader for this army because they have not yet been able to defeat the Philistines. Saul is waiting for someone to step up and help him make a decision. The Israel Army is filled with soldiers that are afraid of the Philistines due to their military might and height. One of the main leaders of the Philistine army is a man named Goliath. (The ones with pennies should raise their fists) Goliath is very tall. In one book we are told he is over 9 feet, and in other books we are told he is over 7 feet. For this time in history, anyone over 6 feet is considered tall! 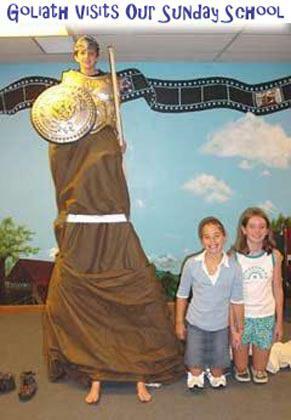 Goliath is a brave solider who has bronze armor to cover his head, chest, and legs that weigh over 125 pounds! (Imagine you carrying not only your own book bag but that of 15 of your friends) He has a bronze sword and a spear that weigh up to 15 pounds. He has a soldier that walks in front of him with his shield that is also bronze and very heavy. Goliath got tired of waiting for the Israel army to fight. So he goes down to the river bed and shouts loudly a challenge. He yells that he is the best soldier of the Philistine army and that the best solider of the Israel army should come over and fight him. The man who loses this battle promises his people will become slaves to the other side. This challenge frightens the army of Israel and no one knows what to do. They have no one who can defeat Goliath. They do not reply. David was strong. He was not afraid to be out watching the sheep alone. He did however want to be with his brothers and fight in the war. He asked his Dad if he could go and join his three brothers. Jesse told him he was too young and he had responsibilities here. David understood and did not ask his father again about going to fight. Meanwhile the two armies are still camped out and no fighting has occurred. Goliath comes out each day and issues his challenge about the best solider coming over to fight him. He does this for 40 days! Jesse gets a message that the soldiers need food and that they are running low on supplies. He tells David to go and take food to his brothers. The journey to the military camp is over 15 miles. David gets up early the next morning and begins his journey to take supplies to his brothers. Remember he is not afraid to walk alone, because he believes the Lord will protect him. He also has fought lions and bears when they threatened the sheep. David arrives at the military camp just about the time that Goliath is yelling about the best solider needs to come over and fight him. Goliath yells that the Israel Army is full of cowards, and they know he is a better solider and will beat whom ever they send down to fight him. David searches for his brothers and asks how they are doing. They give David a hard time and tell him he should not be here, he is too young and may get hurt. He should be home watching the little sheep. They do not like the fact that he might be in danger. David explains that he is here to bring food as their father told him to do. David also asks questions about the tall man yelling at the army. His brothers tell him it is none of his business and that he should run back home now and tell their father they appreciate the food. David does not follow the directions of his brothers as he does his father. He continues to walk around and ask other soldiers what is going on with this large man. David gets angry because he takes Goliath’s threats as a threat to not only Israel but to their God! The soldiers tell David that King Saul has promised that who ever kills Goliath will receive a large sum of money, get to marry the king’s daughter and his people will not have to pay taxes to King Saul. David asks his brothers another question. He wants to know where he can find King Saul, because he wants to let him know that he will kill Goliath, he is not afraid and is really up set at how the Israel army is acting so cowardly. David’s brothers give him a hard time and tell him he should go home and stop asking questions. David walks away from his brothers and several other soldiers show him where King Saul’s tent is. When David meets King Saul he calls him your Majesty. He shares his view of how he can kill Goliath and is very angry that no one has tried yet because he is insulting not only King Saul, the army, Israel but their God. King Saul, at first talks down to David, calling him a young boy who would be killed instantly by this Giant Goliath. David tells King Saul that he is not afraid. The Lord has protected me from lions and bears as I have watched over our sheep. I am strong! I have killed lions and bears with only my hands. I have faith that the Lord will help me with this evil person. Saul finally agrees and tells David he hopes the Lord will be with him, but just in case – please take my sword and armor to help protect you. David did as Saul instructed, but David could not walk around in the heavy armor. The sword was too long and he had trouble keeping his balance. David said, this is too much I cannot even move in this stuff! So he took it off and went down to the river and found five smooth river stones and placed them in his leather pouch on his waist to use with his slingshot. With the sling and stones ready, David walked toward Goliath. Goliath began walking toward him, but he made sure the soldier with his shield was in front of him. When Goliath saw that it was just a boy coming toward him, he laughed and made fun of David. Do you think I am a dog, yelled Goliath? You come toward me with a stick? David yelled back that he was not afraid of him with all of his armor, and sword. That he came to fight him in the name of the Lord who would protect him. Goliath laughed and began to run toward David. David ran toward Goliath and pulled out a stone and placed it in his slingshot. He slung the stone and hit Goliath on his forehead where there was not armor to protect him. He cracked his skull and Goliath fell down and died. David ran over and took Goliath’s sword and cut off his head and showed it to the armies that were watching the fight! The Philistines were the ones who were now afraid and they began to run away. The army of Israel followed them. David became a hero! He had used his strength and his faith to conquer the evil man. 5. Is it hard or easy to be a follower of Jesus? What can make it hard? 6. What makes a Christian strong? Muscles? or Prayer? A Big Mouth? or Kind Words? 3. How did David handle his fear? 4. What is the scariest thing facing students at school everyday? How would David handle those giants? 5. What do you think are the scary things in life when you get older? How will you prepare yourself to defeat those giants? For all – Who is your hero today? Why this person? What makes them strong? Older students (third grade and up) will use "Readers' Theater" to dramatize David's battle with Goliath. Many of the Psalms attributed to David are featured in the script. For younger students, have the older students record the reading (with pauses to allow time for movement and action) to be used as a sound track for a puppet show. Alternately, gather together a group of adults and record their performance the Reader's Theater for use by all students in a puppet show. Locate the book of I Samuel in the Old Testament (using the table of contents) and identify it as part of the history of the Israelite nation. Relate the story of David the shepherd and Goliath the giant. Examine that with God's help, David defeated Goliath. Recognize that David is said to have written many of the Psalms. This story of the victory of an underdog is a familiar one in our culture, even to those not familiar with other Bible stories. Some scholars feel that this story may be a legend about David, especially since in 2 Samuel 21:19, Elhanan is credited with killing Goliath of Gath. More giants from Gath were also killed in 1 Chronicles 20: 4-8. Furthermore, the chronology in 1 Samuel indicates that the story may have been inserted at a later time (in chapter 16 David serves King Saul as a harpist, but Saul does not recognize him in chapter 17). Nonetheless, this story of a boy who does what trained soldiers did not dare do wonderfully exemplifies David's trust in the Lord and the Lord's faithfulness to his servants. It emphasizes the Old Testament theme that Yahweh is with the small nation of Israel and gives them victory over powerful enemies. For Goliath puppet: pretend a regular puppet is big, or use a bigger puppet, or have Goliath be "off stage," or have a student dressed up in Bible-time clothes pretend to be Goliath. For older students prepare the scripts by highlighting one reader's lines on each script. Look at and feel a smooth stone and write down words to describe it on the flip chart or chalkboard headed with the statement "Write one word that describes this stone"
Read the script to become familiar with it. Eisler, Colin. David's Songs: His Psalms and Their Story. New York: Dial, 1992. Fisher, Leonard Everett. David and Goliath. New York: Holiday House, 1993. Tell the story. (see The Lion Storyteller Bible for an excellent condensation of the story for reading or retelling). Read the scripture: 1 Samuel 17: 31-51. Look at the smooth stone word list. Philistine army when Goliath fell, Israelite army when Goliath fell? Assign parts and read the story using the Readers' Theater script. Explain that in some churches, Psalms are chanted by a cantor. Demonstrate, and suggest that David consider chanting the songs in the script. Consider recording the performance to play it back for the group, or to play it for another class or program. If another class will be using the recording for a puppet show, be sure to leave pauses for the puppet action. Discuss other things that can be added to the performance, and if time permits, do it again. Have a class of older students record their Readers' Theater reading with pauses for puppet action and movement. Play the tape once so the puppeteers are familiar with the plot and dialog. Play the tape again, with the puppets miming action and moving their mouths (if they are moving mouth puppets) in sync with the tape. You will want to do this several times so that everyone can learn their cues. It may be necessary for some of the action to take place "off stage" (such as the battle with the lion and Goliath being killed and beheaded). Ask: How do you thank God for His gift of love? (Belonging to God: a First Catechism (PCUSA) question # 5: I promise to love and trust God with all my heart. Was David braver than all the soldiers? Why? I wonder how David knew God was with him? What sorts of ‘giants' do we have to face in our lives? Is God with us? How do we know? Have everyone pick up a smooth stone. Say slowly and quietly: Everyone, feel your stone. Rub it with your hands. Feel its weight. Feel its coolness. Close your eyes and think about where it may have come from. Think about how it was formed. Think about David, searching for just the right stones. Try to imagine what was going through David's mind. Take a few moments for silent prayer. "And all God's children say --- Amen. Close with one of David's Psalms, or sing one of the many hymns based on Psalms (such as "All People That on Earth Do Dwell," Presbyterian Hymnal # 220). The Presbyterian Hymnal (John Knox Press, 1990) has a section of hymns based on Psalms. David: It's so peaceful and quiet out here in the fields, watching over my father's sheep today. Sometimes, it is noisy and stormy. Sometimes, I hear lions roar and I hear bears growl -- it's frightening then. But I always remember that the Lord my God is with me protecting me, and then I am not lonely or afraid. Narrator 2: This shepherd's name was David. Narrator 1: David watched over the sheep carefully. He counted them frequently. He named all of the sheep. Narrator 2: But he was not just a shepherd, he was also a musician. He loved to play his harp. The hills around Bethlehem were a beautiful place. David delighted in creating songs praising God for the glory of His creation. David: Sometimes when I play the harp, it seems almost as if the sheep were dancing. you make it rich and fertile. you provide the earth with crops. What a rich harvest your goodness provides! Wherever you go there is plenty. the hillsides are full of joy. the valleys are full of wheat. Narrator 1: But the hills around Bethlehem were also a dangerous place. Especially if you were a sheep. There were rocky valleys and thorny bushes where a sheep could be lost. Narrator 2: And there were lions and bears. David never hesitated to put his own life at risk to save a lamb from a lion or bear. Narrator 1: One quiet evening, David heard a sound that made his blood run cold -- a low growl from the bushes at the lower end of the pasture. David: (whisper) It sounds like a lion! Narrator 2: David was a brave young man. He had faced lions and bears before. But he also knew enough to be cautious and afraid. all the good things I have come from you." and I feel completely secure, because you protect me from the power of death. your presence fills me with joy and brings me pleasure forever. Narrator 1: And David put down his harp and picked up his shepherd's staff and ran down the hill, shouting at the lion, which now had a lamb in its jaws. David: Go! Leave it alone! Drop Abigail now! Narrator 2: David went after that lion. He attacked it and rescued the lamb. The lamb ran off to find her mother. Narrator 1: The lion turned on David. David grabbed the lion by the throat and beat it to death. He took the lion skin home to his father that night. Narrator 2: David lived with his father Jesse. David: Father, I have killed a lion. Jesse: Good job son! Tell me about it. David: God was with me. Narrator 1: David was the youngest of eight sons. His three oldest brothers, Eliab, Abinadab, and Shammah, had gone off to join King Saul in the battle against the Philistines. Narrator 2: As much as David loved his time in the fields watching over the sheep and singing songs praising God, he wanted to be in the Elah Valley with Saul and the Israelite army. David: Father, let me join my brothers Eliab, Abinadab, and Shammah in service to King Saul. Jesse: David, you know we have discussed this before, and my answer has not changed. No. You are too young. I don't want to hear any more about it. Narrator 1: David was an obedient son. He did not bring up the subject again. But that does not mean he stopped thinking about going to battle for his God and his King. Narrator 2: Then, one day, the unexpected happened. Jesse: Son, it has been a while since we have had news of your brothers and King Saul's army. Take this grain and bread to your brothers in the camp. Take these cheeses to the commanding officer. Find out how your brothers are doing and if they are well. And then come home with the news. David: Yes, sir! Thank you! Narrator 1: So David set off with joy in his heart and a song on his lips. O Lord, our Lord, your greatness is seen in all the world! it is sung by children and babies. you stop anyone who opposes you. mere man, that you care for him? Philistine soldier 1: Can you believe we have been here forty days, and nothing has happened? Philistine soldier 2: If only all wars were this safe and easy. Philistine soldier 1: Yeah. Where did they find that big guy, anyway? Philistine soldier 2: You mean Goliath? He's from Gath. I have never seen anyone that tall before. Do you know that he's over nine feet tall?! Philistine soldier 1: Where in the world did he get his armor? It has to weigh more than I do. Plus he has that helmet and a javelin and a spear. He's not only big, but he's strong! I'm glad I'm not an Israelite. Philistine soldier 2: The Israelite soldiers sure don't seem to be worth much. None of them has stepped forward to fight Goliath yet. It's been forty days! Their king, what's his name, Saul? Philistine soldier 1: Yeah, King Saul, that's it. He's the first king they ever had. Philistine soldier 2: Well that explains a lot. I don't know why he doesn't just order someone to fight Goliath and get it over with. Philistine soldier 1: Maybe he's hoping that if he waits long enough, we'll forget about it and go home. Philistine soldier 2: Or die of old age. Philistine soldier 1: Yeah, maybe. Narrator 1: And all is not quiet and restful in the Israelite's army camp, either. Let's listen in on some of David's brothers and their comrades at arms. Eliab: Twice a day for forty days now. Abinadab: It's been awful, hasn't it? I'm not sure I can bear to hear that monster shout at us again. Shammah: It's almost enough to make me wish I were at home with David, watching the sheep. Eliab: Shammah! How can you say such a thing! You know it is our duty, and a great honor, to serve in King Saul's army. Abinadab: I'm not sure that I feel like I am serving any wonderful cause. David: Eliab, Abinadab, Shammah! Hi! I brought some food from Dad. How are you doing? Shammah: Shhhhh! Quiet! Here comes Goliath! Goliath: I am Goliath, a Philistine. Choose one of your men to fight me. If he kills me and wins, all the Philistines will be your slaves. But if I kill your man and win, you Israelites will be our slaves. I challenge the Israelite army! I dare you to pick someone to fight me! David: What will be done for the man who kills this Philistine and frees Israel from this disgrace? Who is this man that he defies the army of the living God? Israelite Soldier: King Saul has promised to give a big reward to the man who kills Goliath! The king will give his daughter in marriage. And the man's family will not have to pay taxes. Eliab: David, what are you doing here? Who is taking care of those sheep of yours? You spoiled brat! You just came here to watch the fighting! David: What have I done? Can't I just ask a question? Narrator 2: Some of the soldiers heard what David was asking, and ran to tell King Saul. Israelite soldier: King Saul! There is a young man here who sounds like he is willing to fight the giant! King Saul: What are you waiting for? Bring him to me at once! Narrator 1: David was led into the tent of King Saul. He bowed and spoke quickly. David: Your Majesty, no one should be afraid of this Philistine monster! I will go and fight him. King Saul: No. How could you fight him? You are just an untrained boy. He has been a soldier all of his life. David: Your Majesty, I take care of my father's sheep. Any time a lion or bear carries off a lamb, I go after it, attack it, and rescue the lamb. I have killed bears. Just this week I killed a lion. I will do the same thing to this Philistine, who has insulted the army of the living God. The Lord has saved me from lions and bears; He will save me from this Philistine. King Saul: All right. Go, and the Lord be with you. Take my armor, too. Narrator 2: David was dressed in King Saul's armor and helmet and was given his sword. He could barely stand up. David: OOOFF! Ouch! I can't fight with this. I'm not used to it. Narrator 1: So he took off the armor. And he picked up his shepherd's staff. As he headed toward the battlefield, he stopped by a stream. The Israelites watched as he paused, looked heavenward, and then bent and picked up something and put it in his bag. It looked like a stone. With his slingshot ready at his side, he went out to meet Goliath. O Lord, my defender, I call to you. when I lift my hands toward your holy Temple. Give praise to the Lord, he has heard my cry for help. Goliath: Hey, look! They're finally sending someone out to fight me! Narrator 2: Goliath started walking toward the center of the battlefield. Goliath: It's just a boy! They are sending a boy to fight ME! What's that stick for, little boy? Do you think I am a dog? Come on and fight me, child. I will feed your body to the birds. David: It is true that you come against me with mighty weapons. But I come against you in the name of the Lord Almighty, the God of the Israelite army, whom you have insulted. This very day the Lord will put you in my power and I will cut off your head. Then the whole world will know that Israel has a God. And everyone here will see that the Lord does not need swords or spears to save his people. He is victorious in battle. He will put all of you in our power. Eliab: That's not our baby brother David out there, is it? What in the world is he doing? Shammah: I can't bear to watch! You tell me! Abinadab: He's running toward Goliath. Goliath is just standing there. Now David is reaching into his bag. He took something out. Eliab: It's a stone. Can you believe it? Our brother the shepherd thinks Goliath is a bear he can scare off with a little stone. Shammah: Oh, I can't watch. What's happening now. Is he dead yet? Father will be so unhappy with us. Abinadab: Look! Look! He put the stone in his slingshot, and can you believe it? It hit Goliath -- smack -- right in the middle of his forehead. Shammah: What was that crash? Is the world coming to an end? Oh, I can't stand it. Eliab: Who does he think he is anyway? Look at the little showoff now, picking up Goliath's sword. Abinadab: Look, look, he's cut off Goliath's head with Goliath's own sword. Our baby brother! Won't father be so proud! And look, all the Philistines are running away. Let's go after them! How I love you, Lord! The Lord is my protector; he is my strong fortress. My God is my protection and with him I am safe. he defends me and keeps me safe. and he saves me from my enemies. Narrator 1: And so, David faced Goliath and defeated him with God's help. Narrator 2: David continued to serve King Saul, and eventually became King himself. But, that is another story. Cohen, Barbara. David: A Biography. New York: Clarion Books, 1995. Print. Diebel, Anne. 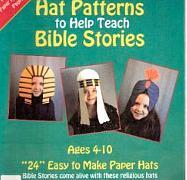 Hat Patterns to Help Teach Bible Stories. Paper Hat Tricks, 1994. Print. American Bible Society. Used by Permission. and Commentary. Garden City, New York: Doubleday & Company, Inc., 1980. Print. Editor's Note: The book by Anne Diebel includes patterns for making "hats" out of paper. As of 2001 the info for ordering was to call 800-830-HATS, 810-349-2560 (this is a small family business -- leave a message and they will call you back). Though as of 2015 it is noted that this book can be procured on-line.